So what is this blog about? It's post number 1 so I should explain it. I have nothing to do with Lego and I'm not promoting their products or services in anyway. What I am involved in is the design and sale of portable air conditioners. The Lego part comes in because I recently got given a huge box of Lego brom my childhood - to clean up and give to my four year old daughter to play with. Whilst sifting through the pieces it struck me there was probably not a great deal missing, and I could probably rebuild some of my old classic Lego space ships for my daughter to play with. So, after scouring the net for a while, I found lots of instructions and inventry lists for building these classic sets and I managed to build two spaceships, including the transporter set 918 with only minor substitutions. I found this process to be very satisfying and started looking at modern Lego sets that are aimed more at adults. This lead me to the Star Wars Lego UCS series, which are all impressive and I'd love to have the space and money to build some of them - but I don't really. The Super Star Destroyer is over 1.2 Metres long and costs £300... And it's way off being minifigure scale, if it was minifigure scale and we assume minifigures are scaled 100 - 1 (Assume person is usually about 2 Metres, a minifigure is around 2 cm) so the SSD was 17 km in the film, 17,000 Metres, or 1,700,000 cm knock this down to 1% the size, and it's 17,000 cm converted into metres gives you 170 Metres. That would be an incredibly expensive Lego set and I don't think I know anyone who would have space to store it.... Thought I'd love to see it built! This lead me to look at Lego's 'Design by Me' service - which looks really cool. The principle is simple, you down load their software, design your set, then they print a box and instructions for you and assemble the pieces by hand before shipping it out to you. 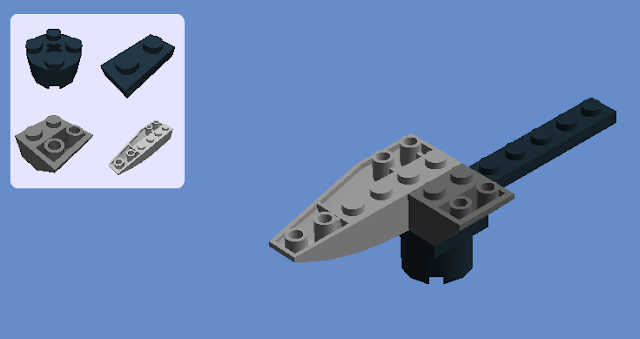 So I decided to have a look at what I could design in the spirit of the classic Lego Space sets. I even had a look at Lego Cad, which gives you more freedom than Lego's software - but it's clunkier to use and you can't have that magic of holding the pieces in your hand and putting it together physically to test your design. Obviously the aesthetics aren't the only part of designing a Lego set. When a set is being prepared for release, hours of play test are done on the completed model. The criteria for UCS sets is more focused on aesthetics than normal Lego - but they still have to be something which doesn't fall apart in your hand! This is going to be the landing gear and bottom of one of the engines. I'm going to start by building a small fighter-like craft, but to make it interesting and different, it's going to be designed to have a pilot and co-pilot like modern light planes.